PIERCE, Franklin, a Representative and a Senator from New Hampshire and 14th President of the United States; born in Hillsborough, N.H., November 23, 1804; attended the academies of Hancock and Francestown, N.H.; prepared for college at Exeter and graduated from Bowdoin College, Brunswick, Maine, in 1824; studied law; admitted to the bar and commenced practice in Hillsborough in 1827; member, State general court 1829-1833, and served as speaker 1832-1833; elected as a Democrat to the Twenty-third and Twenty-fourth Congresses (March 4, 1833-March 3, 1837); elected as a Democrat to the United States Senate and served from March 4, 1837, to February 28, 1842, when he resigned; chairman, Committee on Pensions (Twenty-sixth Congress); resumed the practice of law in Concord; district attorney for New Hampshire; declined the appointment as Attorney General of the United States tendered by President James Polk; served in the Mexican War as a colonel and brigadier general; member of the New Hampshire State constitutional convention in 1850 and served as its president; elected President of the United States on the Democratic ticket and served from March 4, 1853, to March 3, 1857; resumed the practice of law; died in Concord, N.H., October 8, 1869; interment in Minat Inclosure, Old North Cemetery. American National Biography; Dictionary of American Biography; Bisson, Wilfred J., comp., with assistance of Gerry Hayden. 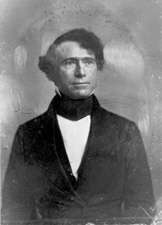 Franklin Pierce: A Bibliography. Westport, CT: Greenwood Press, 1993; Wallner, Peter A. Franklin Pierce: New Hampshires Favorite Son. Concord, N.H.: Plaidswede Publishing, 2004.